GeekRex | Review: The Walking Dead, "Infected"
Review: The Walking Dead, "Infected"
In a series who has had some spotty (to put it nicely) episodes in the past, it seems to be moving in the right direction. It’s moving away from the Governor obsessed past and introducing some great new ideas including a frightening disease which spreads in a more menacing way than zombies and a mystery that’s got me more intrigued than I’ve been since the very first episode. This one also balanced the action and drama sides of the show much better than has been done in most of the past episodes in a way that kept me engaged throughout. I was not particularly looking forward to this season, but with this one I’m (cautiously) back in! Since this is my first review of the show on the site, I should preface this with a bit of my history with the show. I've been a long-time fan of the comic, and that combined with the fact that the show has been filmed not only down the street from me in downtown Atlanta but in my hometown of Sharpsburg as well made me a shoe-in for a die-hard fan. And I was...for a while. I loved the first season, and despite its extremely long lulls, the second season's few exciting episodes kept me pretty hooked. However, the third season really lost me--while it had one or two truly great episodes, most of it was utterly dull and cooked up, and my irritation with this was only compounded by the constant and extremely vague praise that the general public throws at the show and the absurdly long and enduring Talking Dead. So with that history in mind, I wasn't psyched about the new season, but I've been pleasantly surprised so far. This episode largely deals with a new and interesting problem in the prison community: an infection, but not the one you’re thinking of. The idea of an infectious disease spreading among a group of people living in very close quarters is a scary one, and a problem that could have been overlooked in a story where our main concerns are monsters in both zombie and human form. It adds an interesting element of paranoia to the series that was totally missing, and could develop into something reminiscent of classic horror tales like Carpenter’s The Thing. In a world where death in any form means turning into a more bloody form of spreading infection, this new threat is one that is deeply scary. The opening scenes of one of the cell blocks being quietly but swiftly converted into a disease and zombie filled bloodbath is one of the creepiest the show has pulled off. This suspenseful sequence is then really well paired with a pretty action-packed scene that oozes the chaos of a major disaster and feels much more threatening than any of the boring and overhyped scenes with the Governor. This would also be a great place to bring up the visual effects of the show--despite some cheesy CGI segments in places, it’s hard to deny Greg Nicotero’s excellent work on the zombies. From numerous gross bites and zombie kills to the horrifying zombie who presses his head so hard into the fence it begins to slice into his face, the gore and visual effects on the show continue to impress. One of the things I’ve always felt the show lacked that is one of my favorite aspects of the comic is the focus on day-to-day survival. Most of the non-zombie stuff in the show is focused on group debate, who should be the leader, etc. which became very repetitive, particularly in season two. But there are so many questions that weren’t answered--where are they getting food? New clothes? What are they doing to plan ahead in any way, shape, or form? This season, and this episode in particular have done a great job of bringing those issues to the forefront. We deal with the problem of zombie pileup in a way that is both realistic and also pretty terrifying. 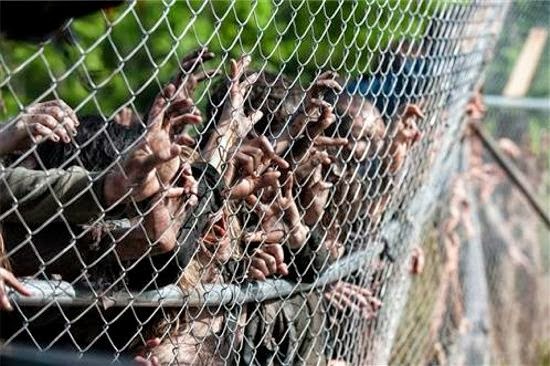 The sense of urgency in the fence toppling scene felt very real, and gives you a real sense of how the relative safety of the prison could be toppled with such ease thanks to the zombie horde. Also of interest in this episode is the new mystery that is developing, one that is a welcome change from the dreaded (and not in a good way) when-will-the-governer-return stuff that drug down last week’s episode. There is somebody up to no good in the prison who is tempting zombies towards the fence with rats and who, it seems, is meting out his or her own brand of public safety by murdering those suspected of the new infection. This is the kind of suspense and character work that the comic does extremely well, so I look forward to seeing how this plays out over the next few episodes. Although I enjoyed the episode overall, I did have a few problems. For one, leaving the pigs as bait for the zombies seemed a bit overwrought. It was only vaguely explained that the pigs may have been infected, but why cut them? Why leave a trail of piglets when simply sitting there in the car seemed plenty of incentive to drag the zombies away from the perilously leaning fence? It seemed dramatic for drama’s sake, which brings me to my other point: the singing. I know this may seem a petty point, but about halfway through the episode I mentioned to my wife, “Oh god, she’s going to sing again.” I like Emily Kinney’s character, but this use of her just hanging around singing is just such a cheap way to imbue some kind of emotion in a show that has a long track record of manipulative melodrama. These may seem like petty squabbles, but it only speaks to how much I enjoyed the episode to say that these are the things I didn’t like about it.